Use this free calculator to get a quick indication of how your credit score might look based on some basic facts about what type of credit you have, and how you’ve maintained it. 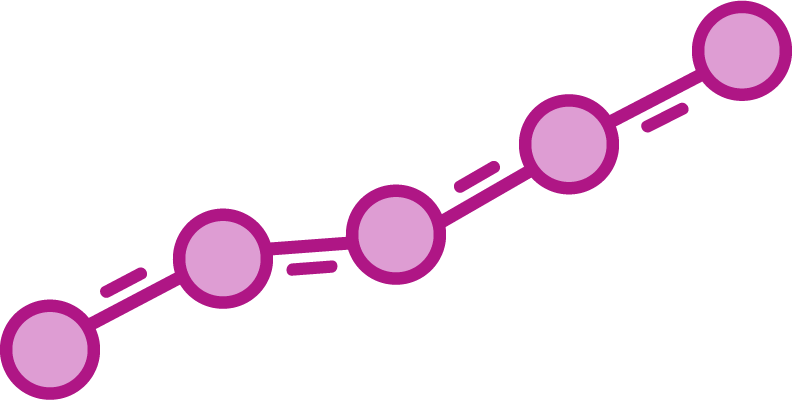 The information you provide is not stored by us - it is only used to estimate your checkmyfile Credit Score. Which of the following do you have in your name? How long have you been with your bank? Each lender and each Credit Reference Agency has its own credit scorecard that’s different to everyone else. Also Lenders often use more than one Credit Reference Agency when they assess you for credit. That makes Credit Scores almost impossible to compare. At checkmyfile we use data from 4 agencies to calculate your checkmyfile Credit Score. You can also see how your Credit Score differs depending on which Credit Reference Agency data is being used. This means you can have a much more accurate understanding of your Credit Score. See at a glance how the information in your Credit Report affects your checkmyfile Credit Score both positively and negatively. Find out if any differences between what's held at the 4 agencies affects you and get tips on how to improve your score and resolve any issues which are pulling your score down. 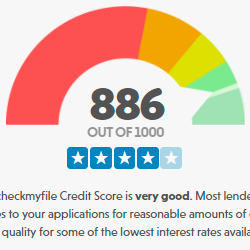 Your checkmyfile Credit Score is uniquely based on data from Callcredit, Crediva, Equifax and Experian, giving you a more accurate idea of how you're likely to be assessed by lenders when you apply. See how differences in data held by each agency affect your Credit Score, and get tips on correcting errors and improving your score. 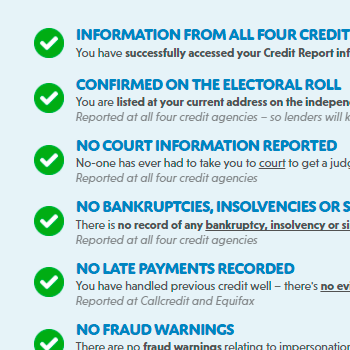 Track how the removal of negative information such as late accounts, defaults or Court Judgments can improve your checkmyfile Credit Score and keep an eye out for the negative effects of adverse information being reported about you.